Charles was born in 1887 in Lower Austria to Archduke Otto and Princess Maria Josephine of Saxony. He grew up in a Catholic family, received a solid Catholic education, and developed a strong devotion to both the Eucharist and the Sacred Heart of Jesus. As a young man he took for his personal motto: “I strive always in all things to understand as clearly as possible and follow the will of God, and this in the most perfect way.” In 1911, at age 24, he married Princess Zita of Bourbon and Parma, and together they had eight children. The assassination of Archduke Francis Ferdinand on June 28, 1914 triggered World War I. 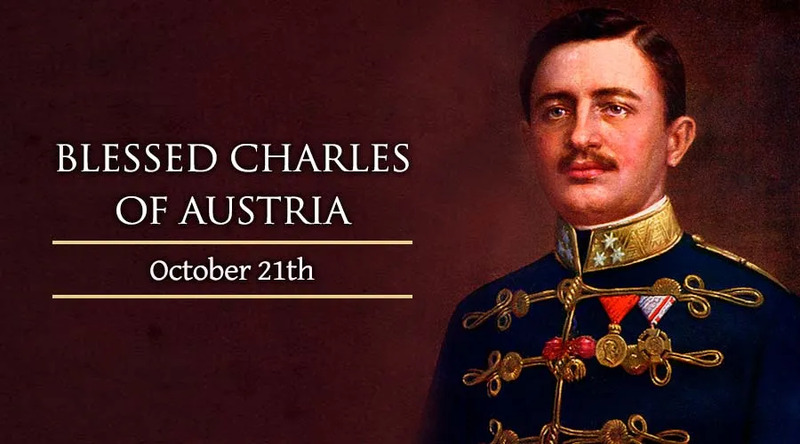 At this point, Charles became the presumptive heir to the throne of the Austro-Hungarian Empire. Two years later, upon the death of his great-uncle, Emperor Francis Joseph, Charles became emperor and king of Hungary. He saw his office as a mandate from God and as a way to implement Christian charity and social reform. He worked to end the war and was the only leader to support Pope Benedict XV's efforts for peace. In March 1919, he was exiled to Switzerland. From there, he tried to prevent the rise of Communism in Central Europe. He also tried to return to power twice in 1921, but gave up at the risk of a civil war. He never gave up his crown, even when exiled to the island of Madeira, Portugal, where he lived in prayerful poverty until his death from pneumonia one year later. Charles was beatified by Pope John Paul II in 2004.